Back in October, Jason and I saw an ad for Empty Faces, a paranormal serial story package. The basic premise goes like this: Each month for the duration of the story, you get a box that contains clues that you work out to solve the mystery. 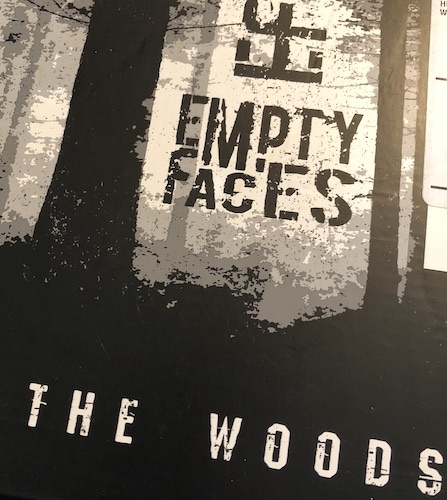 Empty Faces was put out by the same company that released a serial mystery thriller, Hunt a Killer, but this one sounded more like what Jason and I enjoy. We decided to pre-purchase the first five-month episode, The Woods. We’ve received two installments now, and I thought I’d do a quick review-so-far. In this package, we received an introductory letter from a fictional character asking for help. I won’t go into details about this, no spoilers! 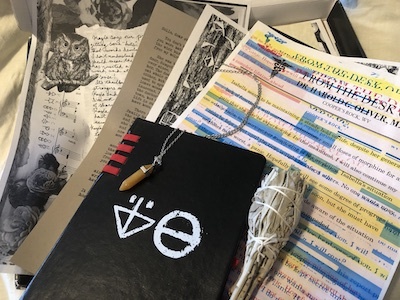 The rest of the package contained several diary entries, a medical letter, a couple pages of different codes, a pendant necklace, a notebook for taking notes on the case, and a bundle of sage (some items pictured below). What we were expecting: to work out a whole hell of a lot of codes and clues to try to solve the mystery that we were asking to help with. What we actually got: Sure, codes and clues to work out, but instead of beginning to solve the mystery, they were pretty much an introduction to the story. Mostly, our reaction to the first package was, “Wait – is that all? ?” One of the codes was easy to work out as long as you knew what you were looking at. (It was a real-world code, and we thought it was easy to recognize, but looking spoilers up after we did our solving, it turns out this is harder for most people because the code is impossible to solve unless you recognize it.) The second code had a short primer to get you started, and then it became pretty easy to convert. Reminded me of middle school trips to fairs where you got to solve simple codes and tangrams. There was also a URL for a blog that made for interesting reading, including some password-protected posts. We were only able to work out one of the passwords, but we have a feeling that’s all we were supposed to work out in the first package. All in all, it was an interesting concept, though we definitely expected to work harder and have more clues on which to build theories. We kept the package and hoped that installment two would build on it and potentially give us a bit more puzzle to work out. 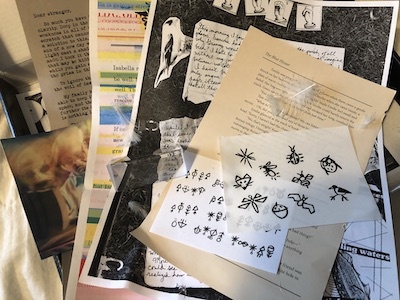 Our second package came with another letter, more diary entries, another medical letter, more codes (some same, some different), a creepy photograph, a book excerpt, a heavy prism, and lots of loose feathers. (Some items pictured below.) Our expectations were a bit lower this time, and we picked up the box a few days ago, thinking we’d solve it in under an hour again. Um…no. Turns out, that first box was just a taster. Not only did this second box have non-code puzzles to work out, but it had codes that had no primer or seed that we had to decipher from scratch, and codes that required us to hunt for a seed. When we finally got a password for one of the protected blog posts, it lead to another, which had even further difficult codes to work through. There were a lot of things we hadn’t heard of and had to seek out, and in doing so, made new connections that might be significant later in the story. We spent hours on this package over several days, and we’re still not sure if we’ve found everything we were meant to find. There were also a lot of very creepy moments while puzzling everything out, including two that both gave me instantaneous goosebumps. This has been a lot of fun. I was apprehensive after the first box arrived, but the second box more than made up for any ease of the first. I’m really looking forward to future episodes, and maybe if we can wrangle it into our budget, we’ll try another series from Empty Faces when we’ve finished with The Woods. This entry was posted in Personal and tagged collection, speculative. Bookmark the permalink. This sounds interesting please keep us posted o.k?